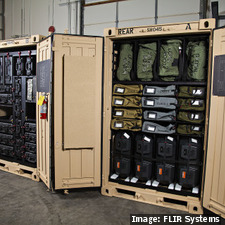 WILSONVILLE, Ore. FLIR Systems, Inc. has received a delivery order for 24 U.S. Army chemical, biological, radiological, and nuclear dismounted reconnaissance sets, kits, and outfits (CBRN DR-SKO) systems, under a five-year indefinite delivery/indefinite quantity (ID/IQ) contract from the U.S. Department of Defense (DoD) in support of the Joint Program Executive Office for Chemical, Biological, Radiological and Nuclear Defense (JPEO-CBRND) DR-SKO Program of Record. The contract -- which is valued at $27.9 million, with deliveries extending through the third quarter of 2019 -- calls for delivery of the CBRN DR-SKO system, a set of mission-specific kits that characterize and provide full-spectrum CBRN dismounted reconnaissance capability used by the U.S. Military Joint Services by their Weapons of Mass Destruction-Civil Support Teams. Work on the contract will continue to be done out of FLIR’s facility in Elkridge, Maryland.